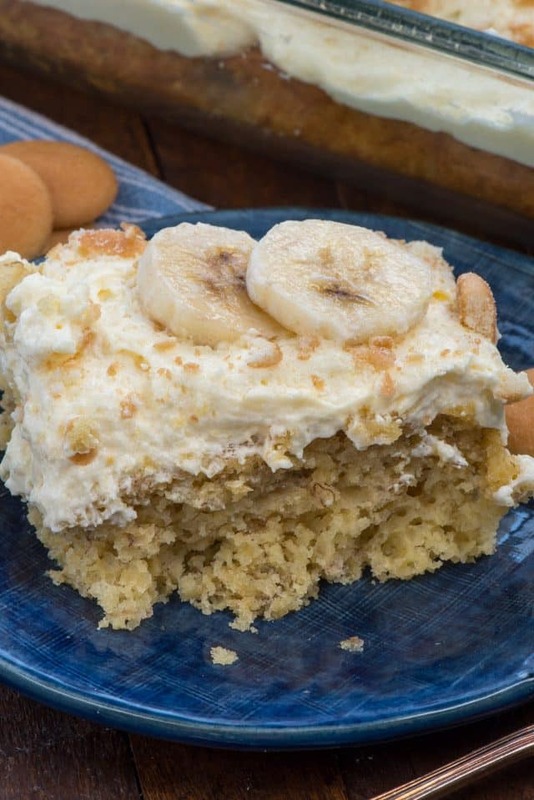 Banana Pudding Cake is an easy banana cake recipe with a banana pudding frosting – it’s a fantastic dessert for any banana lover! Thanks to Almond Breeze for sponsoring this post featuring a cake that is a favorite in our household. There are so many recipes for banana pudding and mashups of banana pudding out there, but this cake is one you should try. When I was cleaning out my freezer last month I realized I have a hoarding problem: I hoard overripe bananas. I think I had at least 2 dozen (full) frozen bananas in my freezer! Did you know that you can freeze overripe bananas? When they start to get too brown I either make banana bread, pancakes or I store them in the freezer. To defrost, just leave them on the counter for a few hours. They don’t look the best but they are perfect to use in baked goods! I decided I needed to use up some of those frozen bananas, so my first thought was to make a cake. Banana Cake is one of my favorite things so I knew I wanted to start there but I didn’t know where to go after that. Should I make a cream cheese frosting? Or turn it into a poke cake? Or maybe do a chocolate frosting? There are so many ways to dress up a banana cake, but I decided to put a twist on an old favorite recipe: banana pudding. Banana pudding is traditionally made with vanilla pudding, whipped cream, bananas, and cookies. 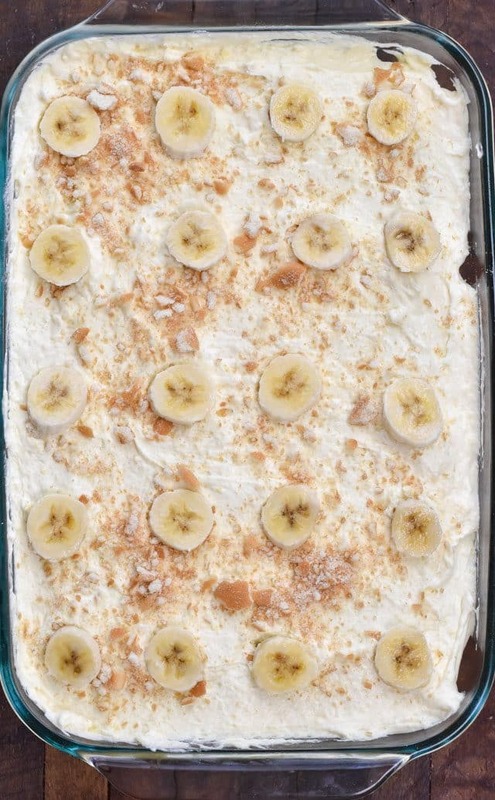 For this cake version, I made a banana pudding frosting that creates an explosion of banana flavor in every bite! That’s right – I said banana pudding frosting! I love banana pudding – the instant kind. 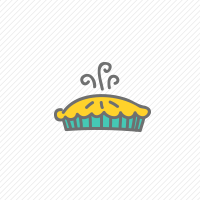 Growing up we had banana cream pie a lot and whenever I think of a banana dessert, that’s the flavor I want. Yes, you can make pudding frosting – and it’s easy! You can make pudding frosting by stirring together any flavor pudding mix with whipped topping. Voilà – pudding frosting. Adding banana pudding frosting on top of banana cake just makes this cake an explosion of flavor! 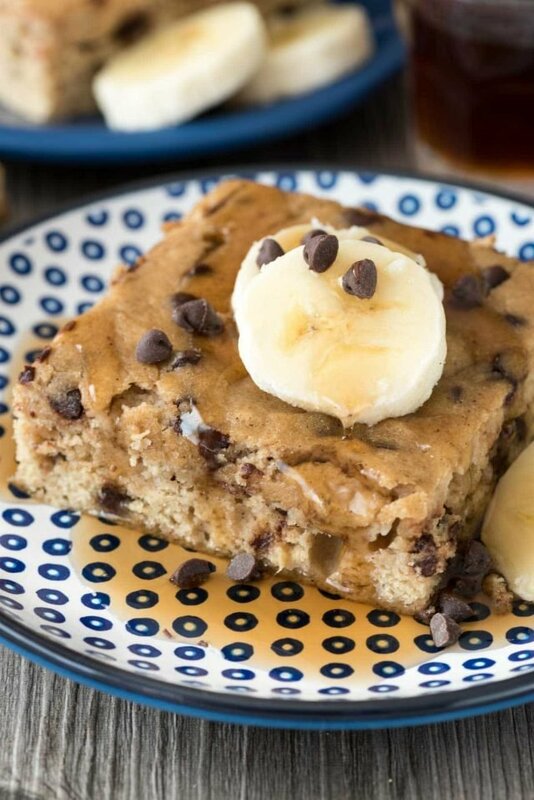 Have you ever wondered how to make an easy banana cake? It’s really simple, especially if you start with a cake mix, which is actually my favorite way to make banana cake. You simply adjust some of the ingredients called for on the box so you can add overripe bananas. The end result would taste great with any kind of frosting, but I especially love using the pudding frosting I used in this recipe. One of my favorite ways to change up a cake mix recipe is to substitute the water called for on the cake mix recipe for almondmilk. My favorite thing to use is Almond Breeze almondmilk because it keeps the cake moist. 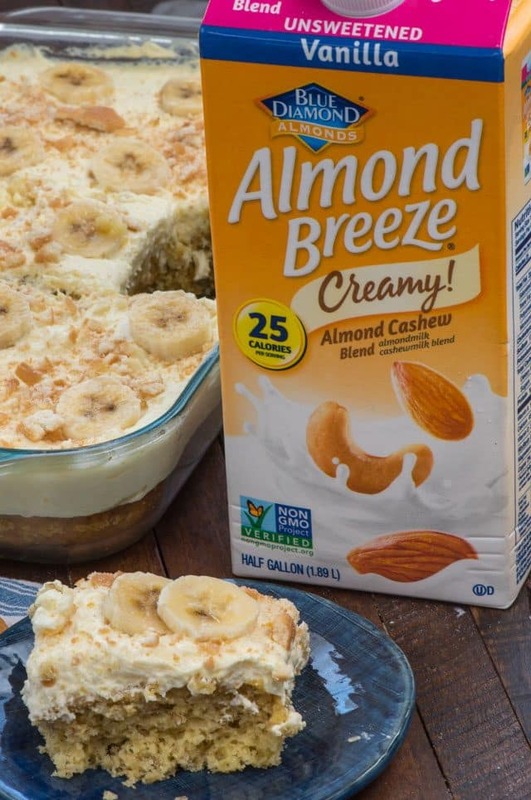 You can use any Almond Breeze flavor in this recipe (the almondmilk coconutmilk blend would be good too) but I used my favorite flavor: Almond Breeze Unsweetened Vanilla Almondmilk Cashewmilk Blend. It’s a flavor I always have in my refrigerator for cereal or smoothies and it goes wonderfully in any recipe that calls for milk. The creaminess of the Vanilla Almondmilk Cashewmilk Blend adds something to the cake that makes it feel more moist and flavorful than if I’d used water. I also added some of the almondmilk in my frosting to smooth it out a bit. Just 1/4 cup helps to dissolve the instant pudding and make the pudding frosting that much creamier! One bite of this Banana Pudding Cake will have you remembering your mom’s banana pudding, it’s that good! If you’re using frozen bananas, let them defrost on the counter for a few hours before making the cake. If you’re using fresh, just make sure they’re brown-spotted. Mash them before adding them to the cake. I love crushing up some vanilla wafers or shortbread to garnish the top, but that’s not required. This would also taste amazing if you used vanilla pudding mix instead of banana. I could eat the cake or the frosting by themselves, that’s how good they are. But together? Together they are banana pudding heaven! 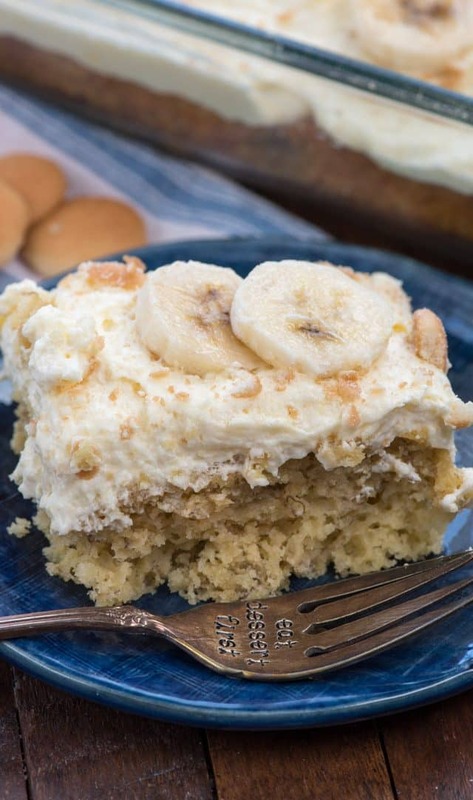 Banana Pudding Cake is an easy banana cake topped with a banana pudding frosting! Preheat oven to 350°F. Spray a 9x13" pan with nonstick cooking spray. Using a whisk or a hand mixer, mix together cake mix, 3/4 cup almondmilk, mashed bananas, eggs, and vegetable oil. Pour into prepared pan. Bake for 25-32 minutes, or until a toothpick comes out clean. Cool cake completely before frosting. Prepare frosting: stir together cool whip with remaining 1/4 cup almondmilk and instant pudding. Frost cake, garnishing with more banana and/or crushed vanilla wafers. 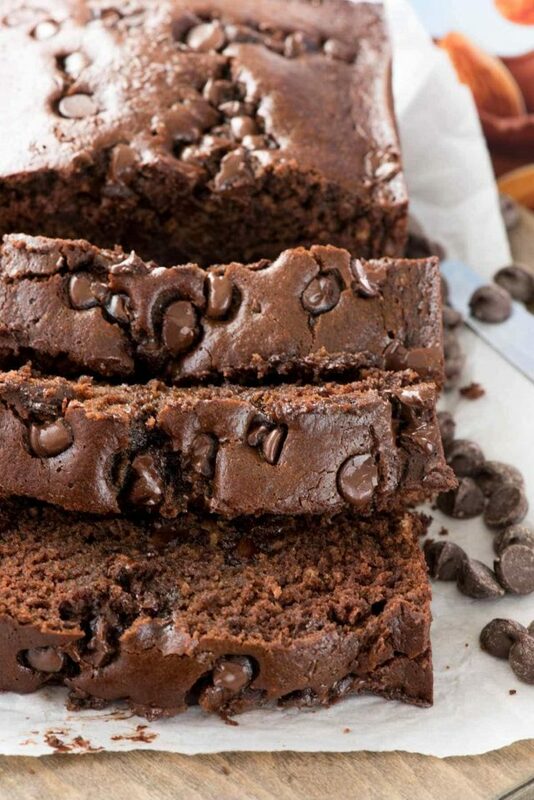 Triple Chocolate Banana Bread for breakfast! Banana Pancake Cake is another favorite! 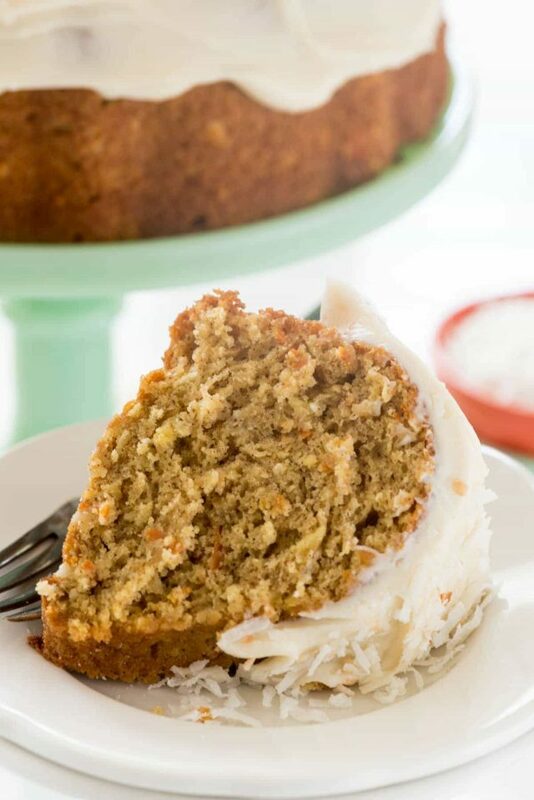 Coconut Carrot Cake is a favorite cake all year! I am so sorry to hear about your FIL. He sounds like a great person and supporter. I had a great FIL also. I miss him and wish he could be a grandpa to my children. I think as we get older we realize how short life really is. I realized this when a dear friend passed away. It caused me to think about what next? I know your family is not religious but I would ask you to read in the Bible the book of John. Jesus can really gift comfort like no one else. Prayers for your family at this difficult time. This recipe was out in the 80’s by chiquita banana and you use a bunt pan. I pulled mine out the other day and tried with lemon pudding. Results were amazing!!!! !